In January at CES it was clear that the trend in desktop 3D printers was all about “mini” 3D printers. It seemed that every company was either introducing a mini 3D printer as an additional product to their assortment, or was entirely built around a mini 3D printer. We reached out to all of the companies that make a mini 3D printer in an effort to review as many as possible, we are calling our series of mini 3D printer reviews the “Battle of the Minis.” We contacted all of the mini 3D printer manufactures at the same time, and in an effort to be completely fair and unbiased we decided to review them in the order that we received them. Therefore, in this first Battle of the minis installment is the M3D Printer Review, as it was the first to be received. The M3D printer started as one of the most successful 3D printer Kickstarter campaigns, concluding on May 7th, 2014 after raising $3,401,361.00. Now more than two years later the Maryland based company is in post reward production, selling their 3D printers for $350 each, and I have seen ads on Facebook for sales that sell them for even less. This is very impressive especially when we read so much about common delays and failed Kickstarter 3D printer projects, most notably is the failed Peachy 3D printer. Immediately upon opening the box, the package design makes a very professional statement. This is a serious company that knows you do not get a second chance to make a first impression. When I saw the quality white corrugated cardboard box with full color photo of the printer, I wanted to rip it open as fast as I could! Once inside I found the printer to be very well protected in bubble wrap. 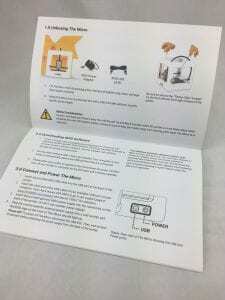 A nice quality full color user manual (booklet) is provided to walk you through the steps of setting up the 3D printer. I followed the instructions to the letter to make sure I understood the user experience the company intended. The instructions were clear, easy to understand, and made me confident that I was going to be up and printing in short order. All I had to do was unwrap the printer, remove the sky blue tape that was securing moving parts, remove some 3d printed gantry clips, install the desktop software, load the filament provided, and I would be good to go. I want to take some time to highlight the design of this 3D printer. This is not just an engineered machine, the final product is the result of some experienced and carefully considered industrial design. While this 3D printer is rather small and simple, its form does not simply follow function, as so many others do. This product is an elegant example of what a well designed product should be, from the form, fit, and finish, to the user experience when interfacing with the hardware to load filament, they thought of everything. One major example is the braided covering to the filament tube. Most companies would simply use a white plastic tube because that is all that is required for the printer to function properly. The designers of the M3D elevated this basic part that would otherwise be accepted as simply “necessary,” to a design detail that demands your attention and evokes a feeling of confidence that this is a special product. Unfortunately, my user experience trying to print files on the M3D printer did not live up to the quality of the physical product design. In order to load filament into the M3D you must first install their desktop software and connect the printer to your computer via USB. I am primarily a Mac user, so I followed the instructions to go the M3D website and downloaded the latest Mac software. After installing it I was instructed to power on the M3D printer and connect it with the USB cable provided. I waited, and waited, and nothing happened. This is not my first experience connecting a 3D printer to my Mac, so I tried everything I could think of to get it to connect, but still nothing happened. I reviewed the FAQ on the M3D support site, and followed any instructions I found there, although none of the troubleshooting tips seemed to directly apply to my situation. Finally I had to seek help from M3D Customer Support. I sent an email, and got a reply within one business day with some instructions on something to try. This technical support process continued over the course of 10 days. Nothing worked. They even sent me a code script to run on my mac in the program called “Terminal”, which will be familiar to any of you that remember the days of DOS on early PCs. It was a program that was supposed to search my Mac for the connections and communication issues to help their software developers determine why the Mac OS was not seeing the M3D printer when it was connected via USB. The first two times I tried to run the script it did not work, so each time I emailed Customer Support and informed them. Finally after I received the third script, I ran it in Terminal and it did gather the required data. I provided the data to Customer Support, but never heard back any result or solution. A week later I emailed to ask if they had found a solution, and was told no, they had not heard back from their software developers. This M3D printer review would have ended here had I not decided to abandon using a Mac to test this 3D printer. If I were a consumer who paid for this 3D printer, I would have certainly returned it by this point. Desktop Software connected to the 3D Printer. The printer turns the color of your actual printer when connected, in this case White. 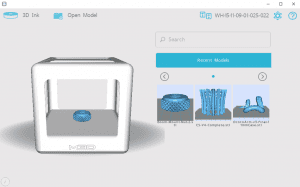 So I moved onto a Windows PC, while not my preferred operating system, I was determined to test this 3D printer and complete my M3D printer review. I used an HP PC with Windows 10 installed on it. After downloading the latest software and installing it, I am pleased to be able to report that the Windows machine immediately recognized the M3D printer! Woohoo! 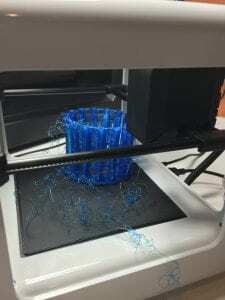 There was an obvious indication on the desktop software that confirmed the 3D printer was connected. So now I could finally load the filament, which is the next step. The M3D printer is so simple that there is almost no hardware setup needed. 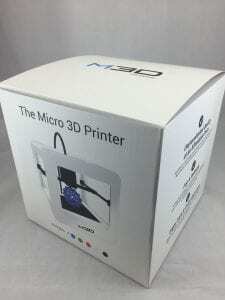 The 3D printer comes pre-calibrated from the factory, so all you need to do is remove the packaging material, load filament, and you are ready to print. There are two ways you can load filament (which M3D calls 3D Ink) into the print head, there is an internal location to hold their small spool, or you can feed filament directly into the top of the print head from a filament spool located somewhere outside the 3D printer. I really like the options available to the user. I can see that if you are setting up your child or teenager to use the 3D printer that using the internal location keeps things contained, but as an experienced user I would prefer to just load filament into the printer directly from a rack of many colors that I already have. So this printer gives you the option, well done M3D! Loading filament requires using the desktop software. First you must raise the print head up so you can remove the build plate. Slide it towards the back of the 3D printer and the front edge will lift up at an angle, when up enough it can be lifted out of the printer and reveals a reservoir to place an M3D 3D Ink spool. You feed the filament into the end of the Bowden tube in the reservoir until you meet with resistance. Then you use the desktop software to load the filament. The print head contains the filament drive motor, and is sealed. The software heats the nozzle and pulls the filament in. Once you see it extruding from the nozzle you stop the process. Before you can print you need to place the spool of filament into the reservoir, carefully winding the filament so it will unwind properly. Lastly you need to put the build plate back in place by inserting the back edge at an angle, lowering it, and sliding it forward until it snaps in place. This system is very clever and efficient, and further excited me about how well designed and engineered this 3D printer is. print (middle layer thickness) and to use a raft. It has been my experience that until I know a printer’s capabilities well, using a raft eliminates some variables that can impede good print results. This print appeared like it was going to work, until 70% through when the nozzle knocked the entire print right off of the print bed, raft and all. Upon examining the incomplete print I noticed that there were some errors in the slicing process because there was geometry that printed that was not a part of the model or the raft. 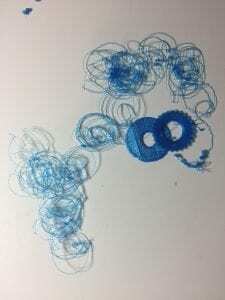 There were also a lot of strings in this print, many more than I would accept as a “good print”. longer than that, because at 24 hours, shortly before the first print failed, it still had about 30% left to print, so the entire print would more likely have taken about 36 hours to complete. That is seriously slow! I had come to believe that my MakerBot was slow, compared to other 3D printers we have tested anyway. But now I have a fresh perspective on what slow really is. Mess of filament after the Knurled Nut raft was knocked off the build plate. Still determined, I decided to change course and print a smaller and simpler object so I could try to achieve some success more quickly, and then build upon that. So I loaded a knurled nut for a microphone boom mount that we have printed on many printers with great success. It takes 45 minutes to print on most printers, but takes two and a half hours on the M3D. 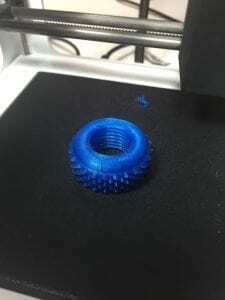 I made many attempts to print this knurled nut on the M3D, and on each attempt it would lay down the raft, but in the process would leave a large glob of filament that would inevitably be hit by the nozzle. When this happened it would knock the raft off of the build plate, causing the rest of the print to fail. Frustrated with this reality I contacted Customer Support again, and this time I requested a phone call, and informed that that I was conducting an M3D printer review. They arranged the call with me a few days later, and on that call they informed me that there was a flaw in their Windows software, and if you select to have the printer home the nozzle before each print (which is recommended, and exactly what I did) that version of software clears out all of the calibration data before it attempts to print. That means none of my prints even had a chance of printing correctly because the printer did not know where the nozzle was relative to the build plate. The Customer Support rep informed me that the latest software, the one that I was instructed to download and install, was flawed. He also admitted that he had recommended to his management that the V1.4.0.9 version of the desktop software be removed and replaced with the earlier V1.4.0.7, which did not have this calibration problem. But the flawed software remained on their site with no indication of a problem. I had looked carefully all over their support site, and there was no mention of a problem with their latest desktop software. Finally I was provided a special link to an older version of their desktop software that did not have this calibration clearing problem. This revelation was very disturbing to me, and is so inconsistent with the company message that I am convinced that someone at M3D, either in software development or Customer Support, was trying to hide from their their management that there was a problem with the desktop software. They were likely trying to rush a software fix and publish a new software release before they had to admit that there was a problem with the existing version. I am shocked and disappointed that this company which pays such close attention to detail in designing and manufacturing their hardware would be so careless with their software. This is a significant failure of management, either rewarding perceived performance over honesty, or they do not have feedback loops or systems in place to properly track user experience through Customer Support. Either way, it is not impressive. I think any user would far prefer that a company take responsibility for a bad software release, remove it from their site, and advise users to download an earlier more reliable version. Instead they have caused me to waste a lot of time trying to figure out what I was doing wrong. Finally I was able to get rafts to print properly. With the older version of software installed I was finally able to get a raft to form properly. However, now that I got further along in the process, I encountered more obstacles. Each print I attempted would get knocked off of the raft. I tried many different layer thick ness settings, and everything else I could think of, but I still could not get a complete print. Remember that I was using the filament provided to me by M3D in the box with the printer. I was not trying anything fancy like using my favorite filament from another manufacturer. After many more failed prints it is clear to me that the M3D slicing software is flawed in how it sets the gap between the raft and the good part. In my estimation there is just not enough of a bond to hold the good part in place for it to print completely before it gets dislodged from the raft by the nozzle’s own movement. Side by side view showing a shifted / misaligned print on the left, and a good part on the right. So the next logical thing to try was to print the part without a raft. When I did this I finally got a part to print completely, but with another significant problem. This time the print shifted in mid print. So I got a completed part, but the top portion was offset several millimeters from the lower portion. What this demonstrated to me was that the M3D printer’s movement is what I would call “relative” instead of “absolute.” This 3D printer uses a belt to control the Y axis and a rack and pinion to control the X axis movement. When the printer homes the nozzle it intentionally allows the belt and rack to skip, trying to move to the back right corner even if it were starting from the front left corner. It tries to move it that entire distance just to be sure the nozzle is home. 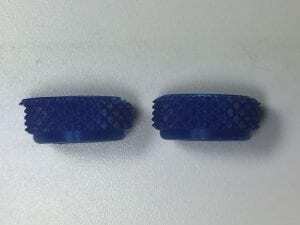 In order to not break the 3D printer, it was designed so that when the nozzle meets with resistance, the belt and rack will skip teeth without causing damage to the hardware. The unfortunate reality of this fact is that when the nozzle encounters resistance while printing, as it would if it hits a cooled glob of excess filament somewhere in the print, it will not move where the code tells it to until it tries to move in a different direction away from the glob. This shifts the nozzle’s position from where it was meant to be, but it continues to create the rest of the print as if nothing had happened. The result looks like part of the print has shifted in one direction. Finally one properly printed part! Note the glob of filament behind the part. Another effect of the extruder leaving globs of filament is that when the print head moves over a glob, it makes a terribly loud buzzing noise. 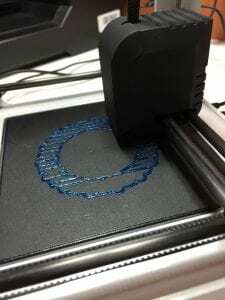 It is very noticeable because this 3D printer is incredibly quiet with it is printing normally. This was one of the most pleasant features of the M3D printer. 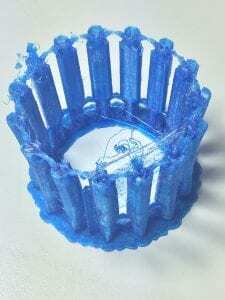 But there is a fan in the print head that spins very close to the printed part, and a glob of filament that is above the level of the current layer will interfere with the fan blades, and causes that sharp buzzing sound. After many print attempts, I was able to get one of the knurled nut to complete properly, but I had to babysit the printer and remove any excess filament that got left behind so that it would not interfere with the movement of the nozzle. This is not practical for any user to do, especially with how slow this printer is. The last thing I tried was to see if I could print to the M3D printer from another slicing program like Cura or Simplify 3D. After a little online research, I quickly learned that M3D does not provide their computer port communication protocols. So other slicing programs can not print directly to the M3D printer. 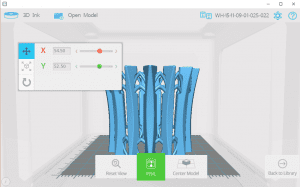 The M3D software does state that you can print a gCode file created by another slicing software, but it must be loaded into the M3D desktop software and sent to the printer through it. So I found a M3D settings template for Simplify 3D, and created a gCode file to be sent to the printer through the M3D desktop software. I know this is going to be a big surprise, but it did not work at all. The M3D software did nothing when I sent the gCode file. So at this point, I had spent much more time than any company could reasonably expect a customer to do, and I was done. I so wanted to love this 3D printer! I gave it every chance, and jumped through the equivalent of hoops to try to make it work. I have delayed the release of this review, and the next 3D printer review in line, so I could give the M3D company a chance to help solve the problems, and turn this into a successful endeavor. However, I am sad to report that this 3D printer, despite its beautiful design, and quiet operation, just did not work well, and I do not take saying this lightly. It is important to note that this M3D printer review took place at a snapshot in time. Perhaps older versions of their desktop software from a year ago work much better, and other versions months from now will work perfectly. But I can only review and report what I have experienced at this point in time. I am ready to move on to the next review in our Battle of the Minis! Have you tried the new software? both new software and pro version looks amazing… congrats for the show, I love to hear you guys going to work! 17 years on the road selling stratasys in south america, and I learn something new with you at all episodes!